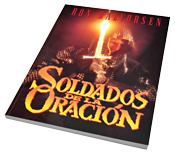 "Prayer Warriors," says evangelist Ron Halvorsen, are God's special forces-His elite frontline troops in the great war between good and evil." Once a teen gang leader on New York Citys mean streets, Halvorsen was a different kind of warrior before God entered his life. In this book, you will learn how to prevail with God, to wrestle with Him in prayer, to intercede on behalf of others, to boldly storm Gods throne with your requests ... Here youll learn the science of prayer that can bring unprecedented power into your spiritual life. As the age-old battle between good and evil rages to a climax, God needs Prayer Warriors to take the battle straight to the enemy. Softcover, 156 pages. Translated into SPANISH.